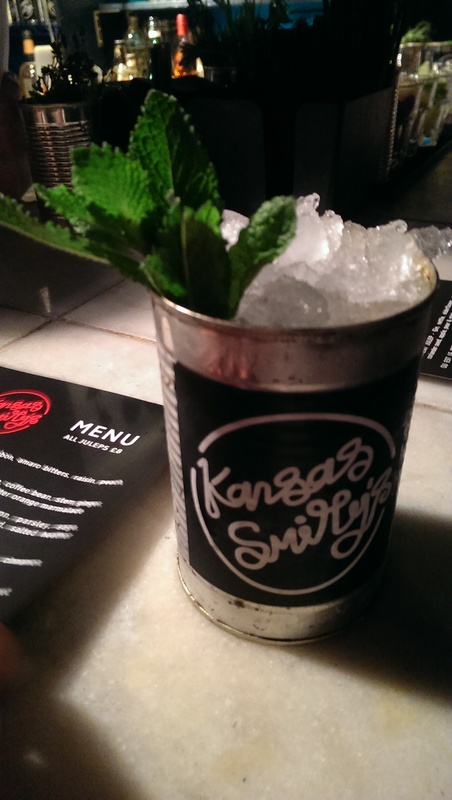 Kansas Smitty’s ‘puts the danger back in jazz’ with their new Jazz n Julep bar at Broadway Market! Taking the place of PortSide Parlour’s first residence (Click HERE for Review! 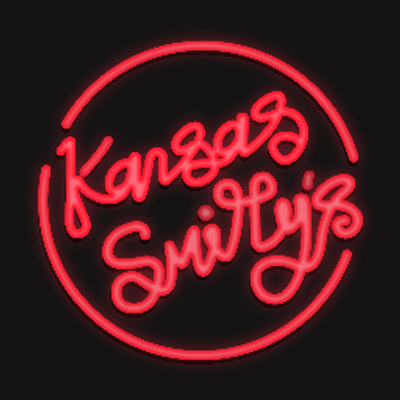 ), Kansas Smitty’s takes a minimalist and powder blue revamp to the basement of Off Broadway. Much space saved for standing guests, banquettes line the walls for table seats that sit about 4 persons, a dark, intimate, candle-lit venue that suits the music fantastically. Namesake of the eight-piece resident house band for whom the clubhouse is both a performance and rehearsal spot. Throughout the week, the venue will be used by the house band and guest musicians to rehearse, perform and create music, a unique setting for live jazz in London. On Wednesdays the bar will host the ‘Basement Tapes’, a weekly concert featuring new projects, guest performers, secret shows and new pieces written and rehearsed that week in the bar. With limited space and high calibre performances these will be hot tickets to get hold of. At other times, band members will play their favourite records for guests, providing a soundtrack of quality music. I was curious to see how KS was about to pull off the all-Julep menu, and boy, did they – a massive collection of spices and botanicals changes the Julep game entirely. Everything from Cassia to Chamomile, these juleps are doing their best to stand out from the crowd and change the way you see the cocktail entirely. Four of the 8 Juleps use sweeter Four Roses Bourbon, and the mint is used just right, and not abused the way it is in many bars. The bar signature, the Smitty’s Julep, is probably the best to start with, and the most balanced and layered of the menu. Bourbon, Amaro bitters, raisin, peach, cassia bar and mint. Beginning with the honeyed winter spice bite of the Four Roses, the raisins make a short entrance, followed by a powerful punch of cassia bark, finally ending on notes of the Amaro’s bitter orange and mint haze. Light, refreshing, and deserving of the title of the bar’s signature Julep. 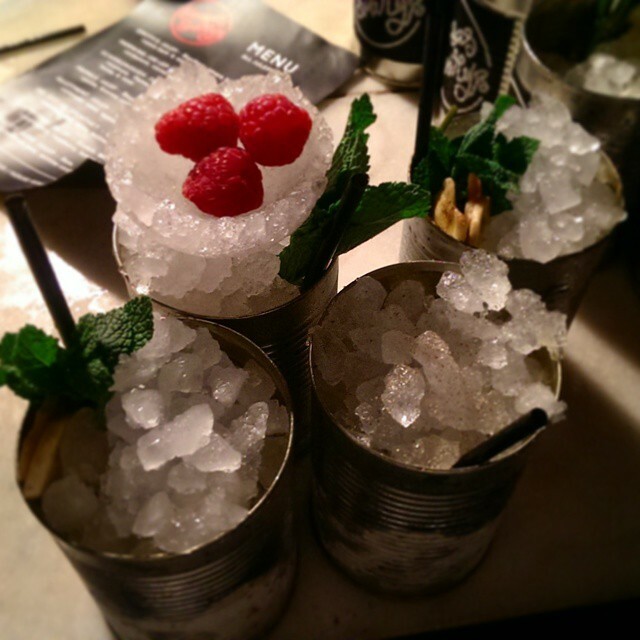 The Allotment Julep takes a twist with gin! Nettle, elderflower, carrot, coriander seed, apple, pear and mint seem like an enormous combination, but the result is a wonderfully light, breezy concoction. Predominantly fruity with the apple and pear, the occasional carrot kick, the fruitiness is broken by the coriander seed and nettle. A great light twist with the heavier drinks on the menu. One such heavy drink being the Jesuit’s Bark – Mt. Gay rum, clove, pimento, lime, grapefruit peel, quinine cordial and mint. Wow. Packing a serious punch, you want to dedicate a good half hour to this drink. The rum and clove don’t mess around, and you get whacked round the face with it – so make sure you enjoy these flavours (luckily, the Hoodooist does). A slight lightening of flavours by the grapefruit peel and mint to the end, with a longer quinine finish, with lingering spice and smokiness of the Mt. Gay. Another one of these ‘flavour specialty’ Juleps is the Scarborough: Bourbon, parsley, sage, rosemary, thyme, toasted almond, salted heather honey and mint. It’s a bit difficult to tell each of the ingredients apart in this one, but you get a good idea with the green herbiness of it, the parsley is notable, as you’d imagine. The toasted almond lingers in the background as the salted heather honey actually is rather powerful, and necessary to balance the green. Then, two themed Juleps: the Morning Joe-lep and the Sleepytime. The Morning Joe-lep goes for bourbon, coffee bean, stem ginger, cardamom, cocoa nibs and bitter orange marmalade. I had my heart set on this one, but a lot of powerful flavours come at you at once, and it all feels a bit muddled and confused. The Sleepytime, though, gets more points. Scotch whisky, chamomile, pink peppercorn, raspberry, lemon peel and mint – you the first slightly sweet, but still smoky bite of scotch, immediately moving on to the raspberry and lemon, finally ending on a smooth length of chamomile. All served with a delicate ice-crater filled with raspberries. Best in terms of presentation, and of the sweeter drinks on the menu, the most balanced. The one cocktail that wasn’t received well at the table would’ve been the Ous Est Le Menthe. Cognac, sherry, tonka bean, cascara, star anise, walnut and nutmeg. The cognac, sherry and walnut stand out prominently, but the drink overall, comes off a bit sticky and sickly, and sadly wasn’t finished. Not that this should end on a bad note, with the otherwise excellent drinks available on the menu. Drinks are to be ordered at the bar, and there will be queues, and massive respect to the bartenders juggling as many drinks as they did! Major props. So there might be bit of a wait for the drinks, but it is totally understandable in the space constraint and number of orders. Excellent work and service on part of the ‘tenders. Summary? 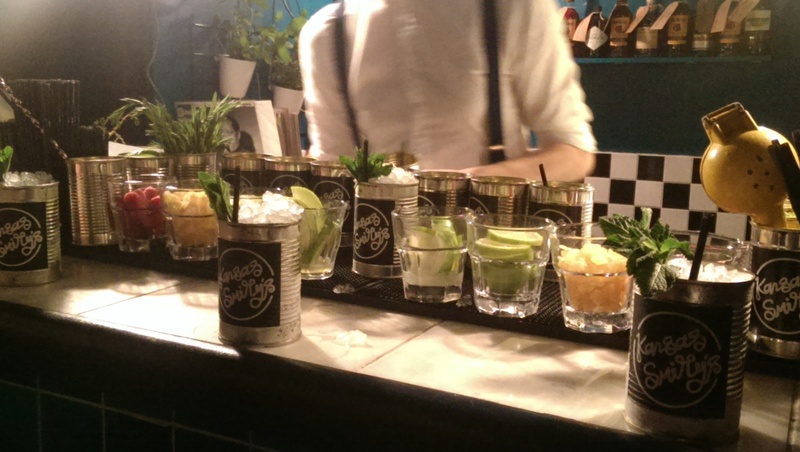 London was long due a bar like Kansas Smitty’s – revolutionising Juleps with a deft hand, and masterfully thought out recipes, bringing back a more relaxed atmosphere to cocktail bars, and finding that great mid-space between gig-venue and cocktails. Definitely worth a visit. This entry was posted in Bars & Cocktails and tagged Basement, Jazz, Juleps, Live Music, Small Groups, Speakeasy, Tiny. ← Yelp! presents: Dr. Alexander’s Mad Scientist Soirée!